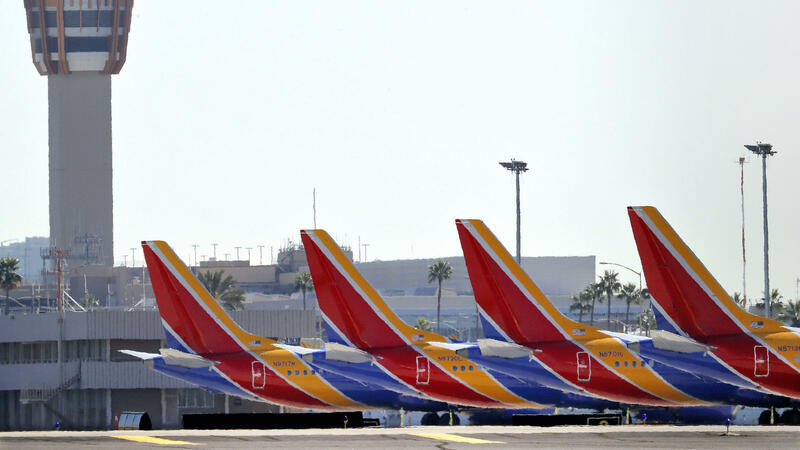 Boeing 737 Max jets are grounded at Sky Harbor International Airport in Phoenix on March 14. 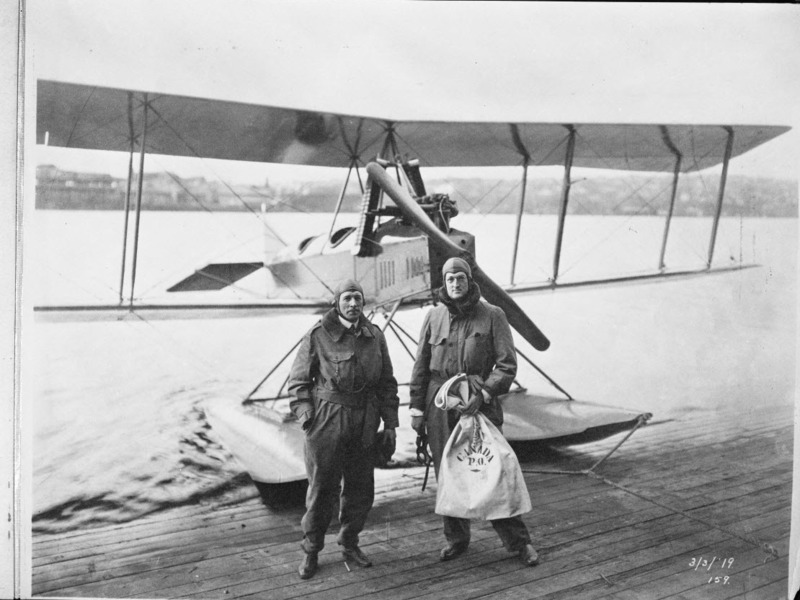 In 1919, Bill Boeing (holding the mailbag on right) and Eddie Hubbard flew the first international mail flight from Vancouver, British Columbia, to Seattle in the Boeing Model C, the company's first production plane. 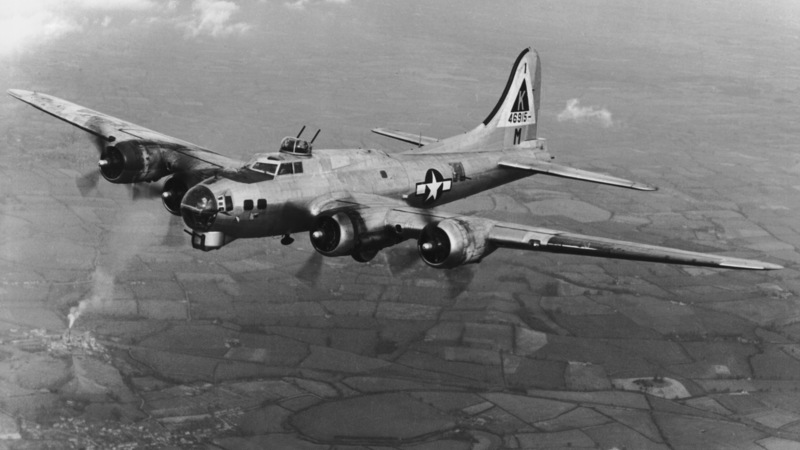 A U.S. Air Force Boeing B-17 Flying Fortress, circa 1945. 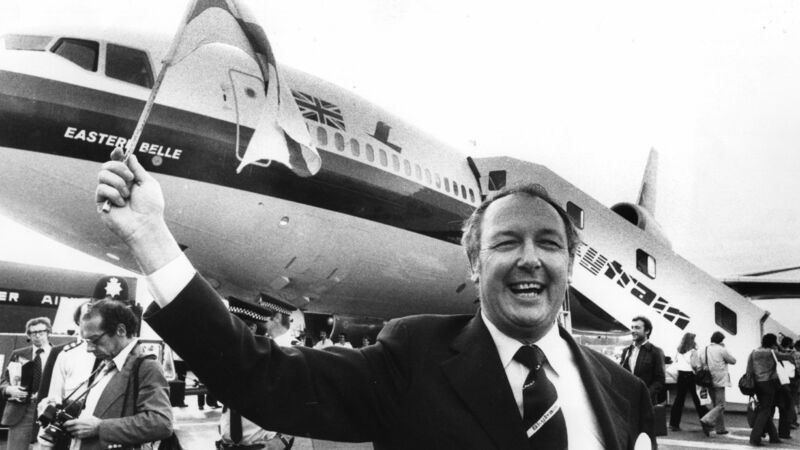 British entrepreneur Freddie Laker waves a flag in front of a Douglas DC-10 in 1977 at the launch of his no-frills "Skytrain" service. The DC-10 had already experienced multiple catastrophes as a result of design flaws, and another deadly crash came two years later. Around the world, hundreds of Boeing 737 Maxes are grounded, prohibited from flying as investigators try to determine exactly what went wrong in two deadly crashes. Those would be the Lion Air crash in October and the Ethiopian Airlines crash this month. Altogether, 346 people died while Boeing has steadily maintained its planes are safe. NPR's Camila Domonoske reports on the century-old company's crisis of trust. CAMILA DOMONOSKE, BYLINE: How bad is this for Boeing? CHRISTINE NEGRONI: I don't think it could be worse for Boeing right now. DOMONOSKE: Christine Negroni is an aviation writer and the author of the book "The Crash Detectives." NEGRONI: They've got their newest airplane grounded. They have no idea of how long it's going to be grounded. I just can't imagine how things could get worse for Boeing. DOMONOSKE: Boeing was founded just 13 years after the Wright brothers first flew at Kitty Hawk. RUSS BANHAM: It manufactured wood and canvas seaplanes in a boathouse in Seattle. DOMONOSKE: Russ Banham is the author of a history of Boeing. He says Boeing got a big boost from military orders during World War I.
BANHAM: And suddenly the company is now really in business. And then the war ended. Government orders came to a standstill. And the company actually was forced to make furniture - residential furniture and wooden boats. DOMONOSKE: But Boeing hung on, got into the airmail business and passenger planes. Boeing created a video to promote its long history. UNIDENTIFIED PERSON #1: Boeing has always built tomorrow's airplanes today. DOMONOSKE: Then the second world war broke out, and Boeing became crucial in the war effort and even closer to the government and military. UNIDENTIFIED PERSON #2: In 1941, the airplanes of today became the bombers and gunners of World War II. DOMONOSKE: Post-war Boeing thrived as an industry leader. The company hit a low point during a recession in the early '70s that struck the entire aerospace industry. BANHAM: There was an 18-month period where Boeing didn't have a single order. DOMONOSKE: But once again, Boeing did what it could to survive, building wind turbines and even getting in the housing business. Eventually it came roaring back. Today Boeing is wildly profitable, America's biggest exporter. And the 737 Max, the currently grounded plane, is particularly important to Boeing. The 737 family launched in the '60s and became the best-selling jetliner in history. But in 2010, rival Airbus created a more fuel-efficient jetliner, and Boeing needed to compete. The 737 Max was the answer. Here's a promotional video from Boeing. UNIDENTIFIED PERSON #3: It's going to give them max efficiency, which leads to profitability, max reliability and, to the flying public, max passenger appeal. DOMONOSKE: Reporting from The Seattle Times suggests Boeing's urgency to get this plane to market put pressure on the FAA. That may have contributed to lax oversight on safety. Boeing disputes this. Many people are raising questions about how cozy Boeing is with the FAA. And in this moment of scrutiny, experts say Boeing has mismanaged its crisis. SANDRA SUCHER: I think that Boeing currently is flunking the can-we-trust-you test. DOMONOSKE: Sandra Sucher is a professor of management practice at Harvard Business School. SUCHER: The worst thing that they could do would be to maintain their insistence that this plane is safe to fly. DOMONOSKE: So far, Boeing has largely stuck to that line. Here's CEO Dennis Muilenburg in a video from Monday. DENNIS MUILENBURG: Our entire team stands behind the quality and the safety of the aircraft we design, produce and support. DOMONOSKE: Boeing supports the FAA's decision to ground the planes and is assisting in investigations which are still underway. It's likely problems will be identified and fixed, but will people be willing to get back on a 737 Max? Boeing's own 787 Dreamliner had problems with its batteries catching fire. Its reputation has recovered. Of course nobody died in those incidents. But consider the DC-10 launched in 1970 by a rival of Boeing's, McDonnell Douglas. The plane had a fatal design flaw. Shutting a cargo door incorrectly could cause a catastrophe and did twice. Nearly 350 people died. Then there was another accident. ABC Chicago covered the scene in 1979. UNIDENTIFIED PERSON #4: There are no survivors, no survivors. DOMONOSKE: Investigators cited a combination of maintenance and design problems. By then, the plane had a horrible reputation. Bernie Leighton is an aviation reporter. BERNIE LEIGHTON: But did earn some rather onerous nicknames amongst pilots, death cruiser probably being the most common. DOMONOSKE: But the problems were eventually fixed. LEIGHTON: When they were rectified, the DC-10 went on to have a very illustrious career with multiple airlines. DOMONOSKE: The plane's maker, McDonnell Douglas, was eventually bought by Boeing, but the plane itself did enjoy a long life, and a version is still in use by the U.S. Air Force. So there's plenty of reason to think that passengers will ride the 737 Max in the future. LEIGHTON: People are going to forget. People are just going to see it as another 737 to take their kids to Disneyland. They're going to focus on how amazing the vacation was and how much they don't like the TSA. DOMONOSKE: But first Boeing has a lot of work to do. Shashank Nigam, CEO of aviation consultant SimpliFlying, says to win back trust, Boeing has to convince multiple audiences. SHASHANK NIGAM: Boeing is working in a dual lane when it comes to restoring its brand both with airlines and regulators, who are the key stakeholders, as well as the general public, who are the ultimate customers. DOMONOSKE: It's a jumbo-sized PR challenge. Camila Domonoske, NPR News. Transcript provided by NPR, Copyright NPR.